Among the friends of Blessed Xenia there was a widow, Mrs. Golubev, and her seventeen-year- old daughter who was noted for her beauty. Xenia like this girl very much because of her meek, quiet character and her kind heart. Once Xenia came to visit them and the girl began to make coffee. "My beauty," said Xenia, turning to the girl, "here you are making coffee and your husband is burying his wife in Okhta. Run there quickly!" The girl was shocked. "My what?! I don’t have a husband... and burying his wife!". "Go!" Xenia answered sternly, not liking any kind of objection. The Golubevs, knowing well that the Blessed One never said anything without a reason, immediately obeyed her command and set out for Okhta. Here they saw that a funeral procession was headed for the cemetery and they joined in with the crowd of mourners. A young woman, the wife of a doctor, had died in childbirth and was being buried. "It was necessary," says one writer, "for her to possess either some super human power or to carry within herself such a strong spiritual fire, such a deep, undoubting faith with which the impossible becomes possible. When one considers God’s great saints, however, who performed such wondrous miracles by their faith, wonders incomprehensible to the human mind, we cannot consider the Blessed One’s ascetic feats as unprecedented or impossible for a person in the flesh. 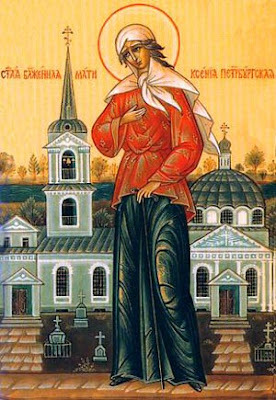 Xenia truly bore that faith with which all things are possible. 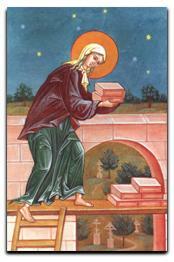 While still living in her body, her soul always soared above this world, dwelling in a living, direct communion with God." Having renounced the vanity of the earthly world, thou didst take up the cross of a homeless life of wandering; thou didst not fear grief, privation, nor the mockery of men, and didst know the love of Christ. 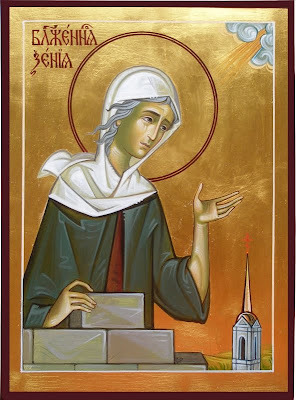 Now taking sweet delight of this love in heaven, O Xenia, the blessed and divinely wise, pray for the salvation of our souls. In you, O mother, was carefully preserved what is according to the image. For you took up the Cross and followed Christ. By so doing, you taught us to disregard the flesh for it passes away, but to care instead for the soul since it is immortal. Therefore, O Blessed Xenia, your spirit rejoices with the Angels. Having loved the poverty of Christ, you are now being satisfied at the Immortal Banquet. By the humility of the Cross, you received the power of God. 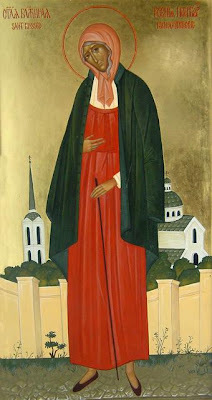 Having acquired the gift of miraculous help, O Blessed Xenia, beseech Christ God, that by repentance we may be delivered from every evil thing.